What you need: Old CD, nails, glue stick, tacky glue or hot glue*, photo of a child, or children, with their father, string, CD Sentiment Pattern (below). What you do: Print out the CD sentiment pattern onto colorful paper and cut out. Have the child, or children, sign their name(s) at the center of the phrase. Cut out the photos of dads with their children. Loop a string through the hole of the CD, cut to the desired length, and tie off. 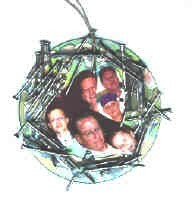 (This frame was made to hang on dad's rearview car mirror, or to be used as a paper weight.) Use the glue stick to apply a single photo or collage of photos onto the center of the shiny/mirror side of the CD. Glue stick the CD sticker sentiment to the back of the CD. Apply hot glue or tacky glue around the photos. Lay nails into glue. Allow to dry. Give it to dad for Father's Day! * Adult supervision is required when working with hot glue. Have the adult use the hot glue gun. Then allow the children to drop their nails into the glue. DO NOT touch the glue! Make a card to give with the frame. Find more Father's Day ideas by searching the Sunday School Teacher's Network-Archives List.